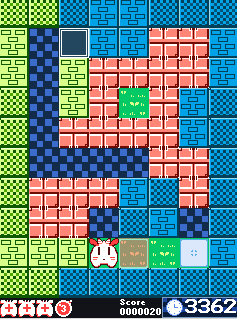 "Bubombgi Chess +" plays much like the classic Bomberman games, along with a new puzzle-like spin on it. In BBGC+, the objective is simple. Break all the blocks in the room as quick as you can, then proceed to the next one. Everything seems to be working as intended in the demo. Pretty fun, and the art is nice. I think this is the first time I've ever seen you type something and not scroll down to immediately see "This thread had been closed to further posting,", DT. Thank you! It's a pleasure to have you guys try it out! -The splash screen no longer ends out of pressing any key. Instead, main controls for the game will tab out of the splash screen to provide a better sense of gameplay understanding. -Title screen is updated, in which includes a in-game controls guide and options menu to toggle sounds/gameplay modes. 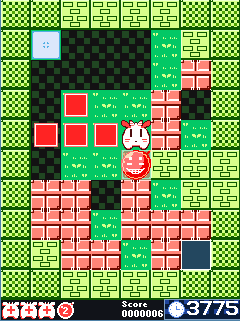 -An "overworld" has been added as level selection. -Controls have been modified. Holding shift no longer toggles bomb placement aiming. Instead, holding Z will toggle it. Pressing X will place a bomb. This decreases the chance of accidentally getting yourself stuck while you move if your ring/pinky finger is left resting on the shift key. -Movement is slightly tweaked, eradicating a strange bug that allows the player to fly across the room while running and placing bombs at the same time. -An experience system has been added. Break a block, and a transparent exp shard will come out. Complete the room to collect all your hard-earned shards for experience. Be quick, because shards will disappear if you leave them out for too long. As you level up, you earn more bombs to place and stronger firepower. Shards will disappear faster the higher level you are. -A dying animation is added. -Some music tracks are added. But the sprites were awesome. I especially enjoyed the bomb "laughing " animations and the trail effect.